See more objects with the tag dining, dragons, cranes, lotus, altars, Buddhist, phoenix, banquets, plum blossom. See more objects with the color saddlebrown saddlebrown darkslategrey grey darkolivegreen or see all the colors for this object. This is a Table frontal. It is dated 18th century and we acquired it in 1958. 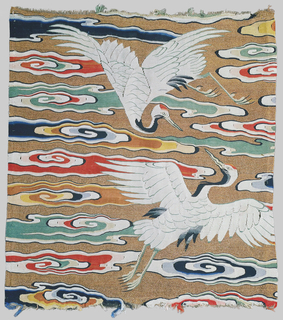 Its medium is silk, metallic yarns and its technique is plain weave with discontinuous wefts (tapestry or kesi). It is a part of the Textiles department. 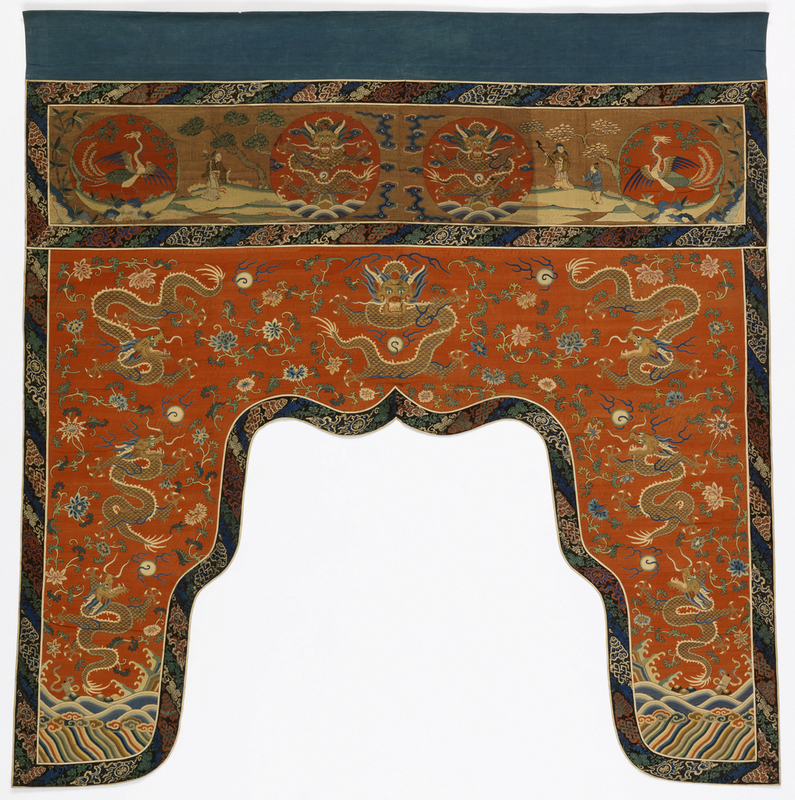 This frontal is heavily ornamented with imperial iconography. The lower section features imagery similar to that found on imperial dragon robes, with lishui waves and rocks and dragons highlighted in gold thread. The top section features roundels with dragons and phoenixes. In addition to these imperial symbols, the top section also includes two human figures associated with seasonal flowers, located on both sides of the dragon pair. The famous Tang poet Meng Haoran (c.689-740) appears on the right with a wooden staff and a servant boy in front of wintry plum blossom trees, the flower of the first month. On the left, the famous beauty Xi Shi (b.506 bce) appears holding a white lotus branch, the flower of the sixth month. This object was catalogued by Alice Baldwin Beer. It is credited Gift of Mrs. A. Philippe Von Hemert.